One of my favorite things about NYC in the Summertime is the Summer Group shows at the galleries. During the next month or so there are many opportunities to attend exihbitions that feature the perspectives of numerous artists, whose work is related by a consistent theme. The McKenzie Fine Art Gallery‘s current show is titled “Color as Structure” and exhibits the work of 16 artists, whose use of color defines the geometries within their paintings, drawings, and sculptures. 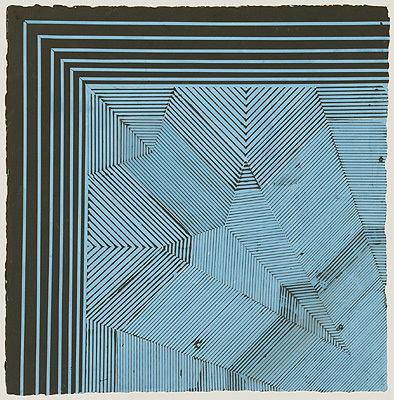 Elise Ferguson uses pigmented plaster on board in her work “NW,bold”. This square work is structured using reflection or mirror symmetry. The diagonal on the square running from the upper left corner to the lower right corner is the line of symmetry. 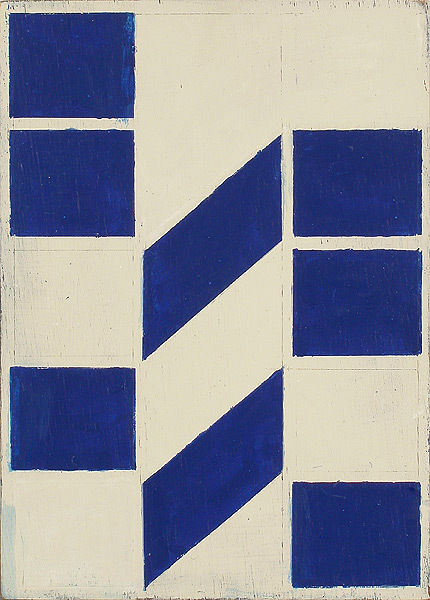 Ferguson creates a dynamic rhythm in this work through her use of parallel lines of modulating widths. The bolder set of lines parallel to the top and left edge of the board contrast with the thinner lines that are parallel to either the edges or the diagonals. There are only a few lines that are not parallel to either the edges or the diagonals. These lines divide the board into geometric regions, creating defined sections of parallel lines going in different directions. There is a hand drawn qualtity to this work that I really appreciate. I feel that the varying widths of the lines enhances the nature of the material and gives the work great energy. Alain Biltereyst’s intimate painting on wood panel “2/0/12” has historical references to earlier geometric abstractions from the 1960’s. With a background in graphic design Biltereyst is interested in signage in the public environment. This work brings the cultural phenomenon of text and images we see in advertising and street art and distills the geometric content to abstract paintings. He introduces the imperfections of the shapes inherent in the street and some handmade signs into the realm of the clean edge geometries of his historical influences. In “2/0/12” Biltereyst has created a rectangular grid system: three columns of five rectangular sections. The pattern in the left column has has been shifted down one rectangle and is repeated in the right column. The middle column features two parallelograms that have the same width as the rectangles in the other columns but are stretched to reach the corners at twice the height. Near the front of the gallery Paul Corio’s painting “Megalicious” drew me into the gallery like a sirens song. All of the pulsing squares and triangles painted like color wheels are the perfect marriage of math and art. Corio has divided the squares into ten triangles by trisecting the sides of each square and then drawing lines from each of those six points and each of the four corner points to the the center of the square. 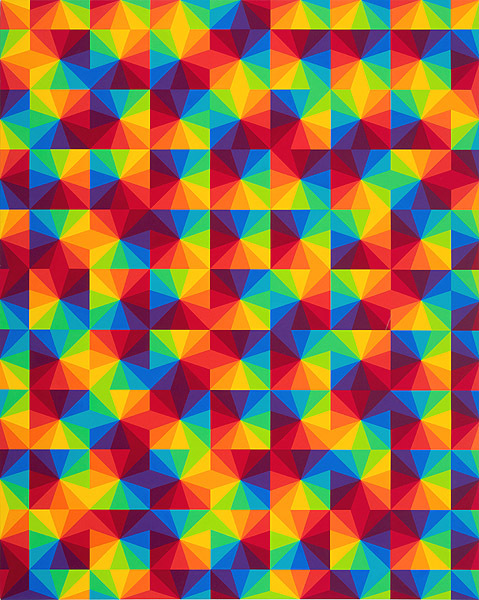 The resulting triangles have been filled in with the colors from a color wheel in sequence. To decide which color goes into the top triangle to begin the progression, Corio has created his own random number generator, using the numbers of the winning thoroughbred horses from race tracks in NY. The number one results in yellow being the top center triangle. Not only does “Megalicious” use geometric forms, there is also an interesting algorithm to determine color placement.